This pendant is made up of 14K rose gold. The shape of this pendant is like a heart and it is free of design, which means it is very simple and decent. This lovely rose pendant has the ability to be engraved; anything can be written or drawn to it with engraved designs which make its demand rise. The dimension of this elegant and delicate pendant is 21mm x 156mm Design your look today with this marvelous piece of art and attain the coveted style icon looks. This ornament is skin friendly and will surely be your proud possession for years to come. 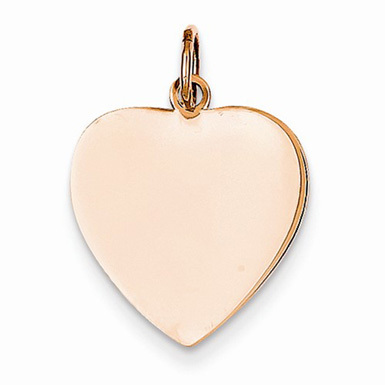 We guarantee our 14K Rose Gold Engravable Heart Charm to be high quality, authentic jewelry, as described above.